Google's Android operating system has plenty to celebrate this holiday season -- and now, a new trio of studies suggests the platform is poised for even more success in 2010. There's no question Android's been enjoying plenty of time in the spotlight since the launch of Motorola's Droid smartphone. But with dozens of new Android devices expected to debut in the coming months -- possibly even including the omnipotent "Google Phone" (have you seen the things that phone can do?) -- the biggest burst may still be ahead. First up: consumer interest. A study released by ComScore this week finds overall awareness of the Android platform has skyrocketed since the start of the Droid's memorable marketing campaign. As recently as August, ComScore says, only 22 percent of mobile users had heard of Android at all. As of November, that number has jumped up all the way to 37 percent -- a substantial increase in a short period of time. Perhaps more important, though, ComScore's research indicates 17 percent of people in the market for a new smartphone are now leaning toward an Android-powered device. That's barely below than the number of people eyeing an iPhone: 20 percent. Back in August, only 7 percent of smartphone shoppers were thinking about going the Android route. The active interest has more than doubled. So what about actual engagement? AdMob -- the mobile ad-serving company recently acquired by Google -- just released some stats about mobile ad impressions served in November. The research shows some interesting trends. According to AdMob, Android phones accounted for 27 percent of all US-based mobile ad impressions last month. That piece of the pie is still significantly smaller than the iPhone's 55 percent, but it's the rate of change that's worth noting. Within the span of a single month, Android's share of US mobile ad impressions grew by 35 percent. The iPhone's share, meanwhile, remained static. Finally, an area often cited as a deterrent to Android adoption: apps. Even though Android's App Market now supports around 20,000 options, some say it can't compete with Apple's 100,000-strong selection. Subjective opinions aside, a newly released report predicts the tides in the app domain are about to shift. The analysis, by ABI Research, suggests the total number of mobile app downloads will more than double its current level by 2014. And while ABI believes the iPhone's App Store will remain the leader in overall downloads, it anticipates that Apple's stronghold will slowly give way to Android's growth. "The iPhone's share of the app market will contract from its 2010 level during the latter part of the forecast period," Wireless Research Associate Bhavya Khanna tells PC World sister publication PC Advisor. "The big beneficiary will be Android, which will see its market share of total application downloads increase from 11 percent of the market in 2009 to 23 percent in 2014." Is the iPhone cowering somewhere in a secure bunker? Don't count on it; Apple's pride and joy is in no danger of disappearing. 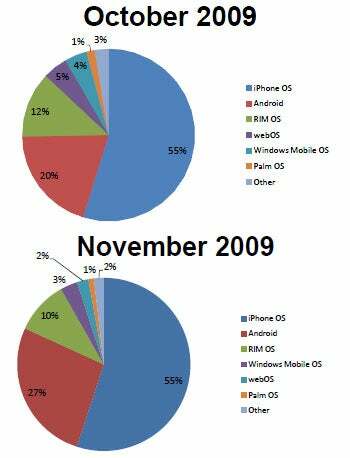 But the mobile market is definitely evolving, and Android is the driving catalyst in the change. That's something you don't need Google Goggles to see.